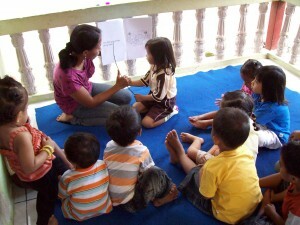 Karin, a multilingual education teacher, walks through a reading primer with a child in her mother tongue. Megan Mercado recently completed a graduate certificate in Literacy from the Graduate Institute of Applied Linguistics. This training equips her to transition from teach missionary kids to developing literacy programs that start kids off learning in the language of their hearts. By developing literacy skills in children, Wycliffe prepares a language community to embrace the Scripture as its translated into the language of the people. a basic and compelling reason for education—the rigorous training of the mind—is so that a person can read the Bible. This sounds too obvious to be useful or compelling. But that’s just because we take the preciousness of reading so for granted; or, even more, because we appreciate so little the kind of thinking that a complex Bible passage requires of us…. The reason Christians have always planted schools where they have planted churches is because we are a people of THE BOOK…. apart from the discipline of reading, the Bible is as powerless as paper. Someone might have to read it for you; but without reading, the meaning and the power of it are locked up. Further training is preparing Megan to conduct rigorous studies on the effectiveness of the programs and to partner with governmental other developmental organizations at a global level. Her current research will directly impact Wycliffe's effectiveness on the field.